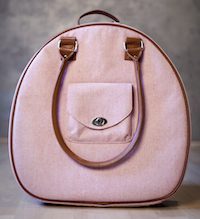 Does your laptop bag need a Pooq? Here at Funchico, we're all about the weird names :). So imagine my delight when I discovered (via the ever-informative Miss604) Pooqs. What are Pooqs? Great question. If you visit their website, it might take you a minute to figure out that a Pooq is a foldable purse hook with a magnetic clasp that is small enough to fit in any purse and is durable to hold up to 25lbs. That means a Pooq will also work for those of us who have netbooks or smaller laptops. Definitely much classier than hanging it on the back of my chair. There are three Pooq collections: Bijou, Vanity and Paris Magnifique. The above is the "Mermaid" from the Bijou collection. Pooqs are created right here in Vancouver and can be ordered via the website. They retail for $34.99.